화면의 중앙에 본존인 아미타여래가 보단(寶壇)위에 결가부좌하고 그 좌우에 관음과 세지보살을 비롯한 8대보살과 사천왕이 배치되어 있다. 또한 화면 윗부분에는 10대 제자와 용왕·용녀 등이 배치된 전형적인 설법도 형식의 그림이다. 채색은 주, 군청 그리고 녹청을 주조색으로 하였으며 중간색은 억제되어 있어 비교적 선명하게 보인다. 본존을 상대적으로 크게 묘사하여 주제를 극대화시키려는 의도가 엿보이며, 법의의 옷주름 역시 비교적 굵고 활달하여 본존의 모습과 조화를 이룬다. 전체적으로 구도는 물론 색감도 안정되어 보이는 우수한 작품이다. 한편 이 그림은 화기(畵記)에 의하면 임한(任閑)이란 화사가 그린 것임을 알 수 있다. 임한은 기림사의 비로자나삼신불도(1718년)를 비롯하여 통도사의 석가설법도(1734년)와 비로자나삼신불도(1759년) 및 석남사, 운문사 등 통도사를 비롯한 경상도 지역의 불화제작을 주도했다고 할 수 있는 화사이다. 전반적으로 필치가 섬세하고 유연함이 돋보이며 인물배치에 있어서도 독특함이 엿보임과 아울러 ‘임한’이 수화원을 맡아 조성한 이른 시기의 불화로서 이른바 ‘임한파’ 화풍을 선도적으로 이끌고 있다는 점에서 자료적 가치가 크다. In the middle of this Buddhist painting of Tongdosa Temple is a representation of the principal Buddhist figure, Amitabha Buddha, sitting in the lotus position on the altar, flanked by eight bodhisattvas including Avalokitesvara, Mahasthamaprapta, and the Four Guardian Kings. 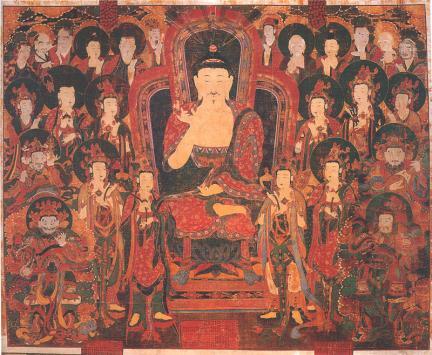 It is a typical painting of a sermon with ten arhats and the dragon god and dragon queen depicted in the upper part of the picture. The major colors are red, navy blue, and green; and the middle colors appear to have been applied with restraint, making the lines of the painting relatively clear. The principal Buddha is larger than the other figures, with the obvious intent of emphasizing him, and the folds of his robes are large and vividly expressed, forming a pleasant harmony with the figure. It is a wonderful work that exhibits a finely balanced composition and coloring overall. According to a record about the painting, it was painted by an artist named Im Han, a leading painter of Buddhist pictures at Unmunsa, Tongdosa and other temples in Gyeongsang-do. His works include the Vairocana Buddha Triad of Girimsa Temple (1718), the Sakyamuni Sermon (1734) and the Vairocana Buddha Triad of Tongdosa Temple (1759). Overall the brushwork is sensitive and the arrangement of the figures shows originality. The painting also has documentary value as it shows how Im Han, as a chief court painter, formed and led the Im Han School of Buddhist painting.